* Mariell's 17" bridal necklace has a stunning design of cushion cut stones surrounded by pave cubic zirconia. 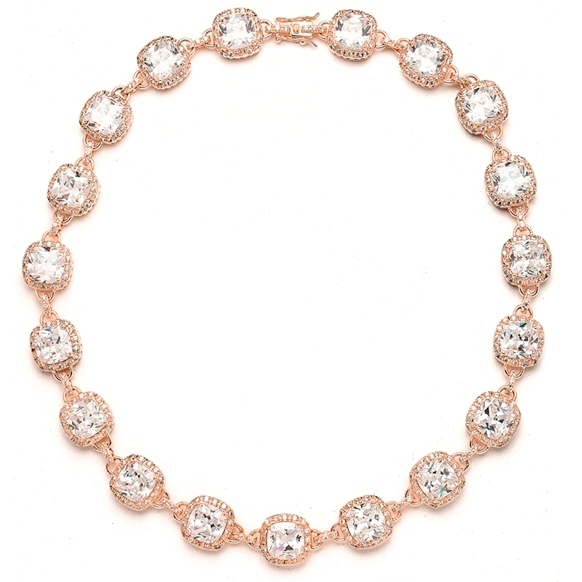 * With a high-polish rose gold finish, this beautiful necklace looks like vintage diamond jewelry. * This regal necklace is a must-have addition to every bridal stockist or retailer's wholesale jewellery display. * Featuring cushion cut cubic zirconia stones surrounded by pave crystals, this gorgeous necklace looks like genuine fine diamond jewellery. * It will give a touch of 5th Avenue elegance to any wedding, pageant, or mother of the bride!